We’d love your help. Let us know what’s wrong with this preview of Two Awesome Hours by Josh Davis. Drawing on cutting-edge neuroscience, Josh Davis, director of research at the NeuroLeadership Institute explains clearly that our brains and bodies operate according Feeling overwhelmed with work and life demands? Rushing, multitasking, or relying on fancy devices and apps won't help. The answer is to create the conditions for two awesome hours of peak productivity per day. To ask other readers questions about Two Awesome Hours, please sign up. This is one of a genre of self-help books steeped in a culture of doing more, faster, better. It's dedication to the relentless optimization of every minute in the unexamined pursuit of commerce triggers my latent inner anarchist and predisposes me to dislike it. But I'm glad I successfully suppressed my instinct to set the book on fire. Because despite the fact that it employs all the hackneyed tropes you've seen before in books of this kind, it's key insight is a bit of finger in the eye to its This is one of a genre of self-help books steeped in a culture of doing more, faster, better. It's dedication to the relentless optimization of every minute in the unexamined pursuit of commerce triggers my latent inner anarchist and predisposes me to dislike it. But I'm glad I successfully suppressed my instinct to set the book on fire. Because despite the fact that it employs all the hackneyed tropes you've seen before in books of this kind, it's key insight is a bit of finger in the eye to its cousins in the genre. That insight is this: that humans are not machines, and that effectiveness is not the same thing as efficiency. What we think of as our selves is a thin layer of consciousness embedded on a big bag of meat, infused with a witch's brew of bio- and psycho-active chemicals. Using your consciousness to achieve a goal you set for yourself requires understanding how your biology and neuropsychology works, and creating the optimum conditions for the goal you have in mind. The title comes from the idea that you can't be optimally efficient all the time, but if you create the right conditions you can be highly effective at the right times. Davis boils it all down to five strategies: recognizing when you have an opportunity to make decisions and taking advantage of those opportunities to make the right decisions; managing your mental energy so it's at its peak when you most need it; working with the natural human propensity to be distracted so it has the least negative impact; using food and exercise in the right ways and at the right times to support your goals; and setting up your environment to influence your thought processes positively. Davis makes reference to research to support his recommendations, amply endnoted, but this is not a research paper. If you're inclined to want detailed proof, you're probably better off going to the original sources. 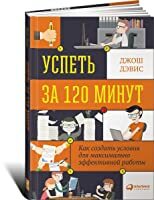 Очень неплохая книга о том, как получить 2 часа максимальной работоспособности в день (если оно вам надо))). Автор предлагает 5 стратегий повышения продуктивности и штук 30 практических рекомендаций. Рекомендации довольно простые, но основаны на последних научных исследованиях (в этом плане книга - настоящий дайджест заметок из научных журналов). Charlotte Mason educators need to read this book. There are many simiarities to Mason's writings on atmosphere and on the body-mind connections in education. You can harness at least two awesome hours of effectiveness every day by following five simple strategies: recognize your decision points; manage your mental energy; stop fighting distractions; leverage your mind–body connection; and make your workspace work for you. This way, you’ll provide yourself with the psychological and biological conditions you need for top performance. Pretty good book with solid ideas for improving productivity. If concentration and decision-making are limited resources, then planning the ideal, productive workday is like managing an intellectual budget (argh, budgeting is my kryptonite!). This is the treasure in Josh Davis' general book. This is a good case for taking mass transit or ride-sharing in order to leave more brain juice for the workday. Daily commuters squander brainpower driving themselves to and from work. Driving in traffic is mentally exhausting and leaves workers much less capable of If concentration and decision-making are limited resources, then planning the ideal, productive workday is like managing an intellectual budget (argh, budgeting is my kryptonite!). This is the treasure in Josh Davis' general book. This is a good case for taking mass transit or ride-sharing in order to leave more brain juice for the workday. Daily commuters squander brainpower driving themselves to and from work. Driving in traffic is mentally exhausting and leaves workers much less capable of giving work their best. You could start here if you've never read anything else about productivity. * achieving solid, quality work in those two hours on a regular basis is better than trying (and failing) to be highly efficient all the time (like a "Start here" theme). * Just focus on getting two very productive hours out of every day. * Declutter work area to remove items causing niggling stressors at the edges of our attention. * Put a few necessary items on farther edges of the desk to encourage open, expansive gestures that increase risk-taking and confidence. * Get up and move around often. * Noise (like inside coffee shops) is only helpful to extroverts and those with excellent short-term memory. Everybody tends to work much better in silence. * Recognize when you’re spending limited brainpower on daily decisions. Five strategies presented in this book seem to be simple but they are quite powerful. We only need two awesome hours to be at most productive time and then we can get a lot of important things done. Strongly recommended. I picked up this book at the suggestion of a colleague. I begrudgingly gave it 3 stars. Here's why: Josh Davis is on to something in the first 1/2 of the book when he encourages you, dear gentle reader, to be intentional about your to-do list. He coaches you on the gazillion different seconds you have throughout your day to make better choices about what gets done vs. not instead of just reacting and ping ponging your way, unfettered and un-purposeful-- through the day. Great advice. For this re I picked up this book at the suggestion of a colleague. I begrudgingly gave it 3 stars. Here's why: Josh Davis is on to something in the first 1/2 of the book when he encourages you, dear gentle reader, to be intentional about your to-do list. He coaches you on the gazillion different seconds you have throughout your day to make better choices about what gets done vs. not instead of just reacting and ping ponging your way, unfettered and un-purposeful-- through the day. Great advice. For this reason, I give 3 stars. However, the second half of this book turns away from coaching you on how to get things done--the most important stuff in two hours--to lecture, lecture, lecture, citing study after study to justify his great idea. The manuscript felt forced like he had to deliberately expand his material into a book length manuscript, thus inserting unnecessary scientific or psychological study after study to support his idea when really the notion of getting things done in two awesome hours could have been a fantastic magazine article. Some good ideas here about time management -- it's not as proscriptive as other books in this genre (you know, the ones that say "only check your email once a week"). Instead it describes how our understanding of human attention and effectiveness is changing, and how the principles of some research studies can be applied to our work life. I've already tried some of the suggestions in the book, such as being aware of shifts in attention and decisions making, and also being more conscious about how Some good ideas here about time management -- it's not as proscriptive as other books in this genre (you know, the ones that say "only check your email once a week"). Instead it describes how our understanding of human attention and effectiveness is changing, and how the principles of some research studies can be applied to our work life. I've already tried some of the suggestions in the book, such as being aware of shifts in attention and decisions making, and also being more conscious about how the timing and amount of food/coffee we take in can affect our energy level and awareness. It does seem to be helping me deal with my mood/energy rollercoaster at work, but it's still a bit early to see if these are going to be long-term, helpful changes. Nothing revolutionary but Josh Davis from the NeuroLeadership Institute has caused me to do something that tons of other self-help books haven't and that is to make a conscious change.
" *Savor each decision point. *Don't start a new task without consciously deciding it's the right one." I read this for my work literary circle. Not much new here- basically the same idea of working on most important first- combined with the idea that you need to pick the right block of time to work on the most important so that you are at your best. Easier said than done with competing priorities. 1. Recognise your decision points. Once you're in the middle of a task, it's hard to change course. Maximise the power of the moments in between tasks to choose the next thing that matters most. 2. Manage your mental energy. Tasks that need a lot of self-control or focused attention can be depleting, and tasks that make you highly emotional can throw you off your game. Schedule tasks based on their processing demand and recovery time. 3. Stop fighting distractions. Your attention systems are designed to wander and refresh, not to focus indefinitely. The goal is to get back on track quickly when you get distracted. 4. Leverage your mind-body connection. Move your body and eat in ways that set you up for success. 5. Make your workspace work for you. Learn how to adjust your environment in a way that benefits you - avoiding distractions and priming you for the required type of work. Aim for a couple of hours of peak productivity and spend the rest of the day on more mundane tasks which don't require much creative or strategic thinking. Decision points can be uncomfortable because there is conflict between possible decision alternatives, and also you have higher awareness at those points so you can be aware of other things on the to do list. Being intentional about what you plan to do immediately after you finish a task makes a lot of difference in effectiveness. - don't start a new task without consciously deciding it's the right one. Planning the reactions we will have to our decision points before they happen allows us to maximise them. Research has shown that planning ahead for likely obstacles dramatically increases our chances of behaving how we would like to instead of just reacting. These plans are called "implementation intentions" - plans to implement a certain action if a relevant cue arises. But planning *not* to do something (like "I will not give into the urge") tends to fail. Instead, plan a new action which you'd prefer to take. Mentally prepare yourself to deal with interruptions as decision points. You may not be doing the most effective thing at the time, so it's good to get an opportunity to reassess! Anger is unusual amongst negative emotions in that it facilitates approach-oriented behaviour, ie actions that move us toward a person, object or idea. Sadness makes us more thoughtful and critically thinking. Anxiety can be reframed as being alert and ready to react - that's what it seems to be biologically. - label tasks on the to do list as "important decisions ", "creative", or "other", and push "other" tasks to the end of the day. - make a few decisions the night before a big day so you don't have to deal with them ON the big day as they might throw you off. Practise strategic incompetence, ie letting go of doing some things in order to allow yourself the time to focus on what's really effective. The brain is wired to respond to distractions so it's futile to try to force it to focus on one thing. You need to remove distractions from the environment instead. However, meditation does help with sustained attention. Mind wandering may have important benefits when it comes to creative problem solving and long term planning. Let your mind wander for some time as long as you aren't getting distracted with something else, and after a short while it should return to the original task. Mình đọc bản Tiếng Việt. Thật thì hơi khó hiểu, mình nghĩ do cách dịch ý. Một số điều tự rút ra cho bản thân. Khoảng cách 3-5 phút để quyết định tiếp theo nên làm gì là cực kỳ cần thiết. Hai giờ không cố định đâu mà do nltt của bạn quyết định đấy. Tức giận, lo lắng, buồn và cả những cảm xúc thoải mái có thể giúp bạn làm việc hiệu quả. Không nên làm việc quan trọng sau khi não đã đưa ra quá nhiều quyết định ( Não làm việc nhiều). 3. Làm thế nào với các Mình đọc bản Tiếng Việt. Thật thì hơi khó hiểu, mình nghĩ do cách dịch ý. Một số điều tự rút ra cho bản thân. 3. Làm thế nào với các phiền nhiễu đây? Haizzz. Tớ là kẻ không thể nào tập trung cao độ được vì não tớ hay đi lang thang lắm. Trước đây tớ hay trách mình sao cứ để bản thân đi lang thang mãi như thế, vì không tập trung thì sẽ không tiếp thu hay làm được việc gì hiệu quả cả. Uhm. Nhưng mà có một sự thật rằng, Não bạn sinh ra là để đi lang thang với những phiền nhiễu ấy. Nếu bạn không tập trung và hay bị các tác nhân bên ngoài làm sao nhãng thì không sao cả, điều đó chứng tỏ là bạn còn bình thường. Việc tốt nên làm là hãy để những tác nhân phiền nhiễu tránh xa bạn ra nếu bạn không muốn não lại đi đâu đó với chúng. Thiền định giúp cải thiện sự tập trung. 4. Tâm trí lang thang liệu có tốt? Cũng tốt đấy. Giải quyết một vấn đề. Xong. Để tâm trí lang thang đâu đó một chút. Nhào vào tiếp tục giải quyết vấn đề. Bạn sáng tạo. Đôi khi tâm trí lang thang là để tính chuyện tương lai. Những kế hoạch và mục đích. Cũng tốt mà. Quan sát bản thân nhiều hơn nhé. Để xem liệu có thật vậy không? Tâm trí trôi dạt thì hãy để chúng trôi dạt vì não bộ được sinh ra là để tìm kiếm các phiền nhiễu mà. Việc của bạn là khoan dung với chính mình, xem việc lang thang của não bộ là điều hiển nhiên, hãy để suy nghĩ đến rồi đi một cách tự nhiên và nhẹ nhàng nhất. Ăn bao nhiêu một lần, Ăn bao nhiêu lần trong ngày,...: Vừa phải thôi và nên chia ra ăn nhiều lần trong ngày nhé. Tiếp đầy đủ nước Vì khi mất nước sẽ cảm thấy mệt mỏi, dễ tức giận và khó tập trung hơn??? 6. Môi trường làm việc ảnh hưởng rất nhiều đến hiệu suất công việc của chúng ta. Liệu một môi trường ồn ào có tạo được sự sáng tạo???. Có đấy nhưng chỉ trong môi trường ồn ào trung bình với mức độ liên tục. Cơ mà tớ thì là người hướng nội nên tớ tạp trung cao nhất là khi không gian yên tĩnh. Đến ánh sáng nhé, ánh sáng mạnh, ánh sáng trắng xanh giúp tốt cho sự tập trung và tỉnh táo. Ánh sáng mờ ảo tốt cho sự sáng tạo. Sự lộn xộn thật sự chẳng tốt lành gì cả. 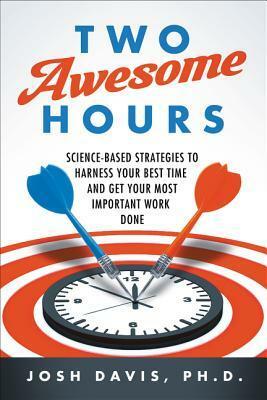 Two Awesome Hours is not an ordinary book on time management. Its premise is that the human brain is not designed to exert itself 100% of the time throughout an eight hour day. The brain is like a muscle. It can only do so much work, and it requires a bit of rest in between periods of intense activity. Two hours is an arbitrary length of time that the author feels is realistically achievable for peak performance in any given day. This length of time is variable; it depends on the individual and Two Awesome Hours is not an ordinary book on time management. Its premise is that the human brain is not designed to exert itself 100% of the time throughout an eight hour day. The brain is like a muscle. It can only do so much work, and it requires a bit of rest in between periods of intense activity. Two hours is an arbitrary length of time that the author feels is realistically achievable for peak performance in any given day. This length of time is variable; it depends on the individual and on the choices one makes throughout the day. Despite the fact that I was a little bit excited reading this book, I honestly didn't find earth shattering ideas or thought provoking concepts. Personally I believe nothing new was contributed to the self-help domain from this book that I already was not aware of. However "Two Awesome Hours" is an great start for entry level fellow humans who are curious about time and energy management. I will keep one outstanding observation though that the author shares with us regarding human performance. Si Despite the fact that I was a little bit excited reading this book, I honestly didn't find earth shattering ideas or thought provoking concepts. Since we are not machines capable of carrying out complex processes infinitely, efficiency is not a metric for human performance. The right metric for human performance and productivity is effectiveness instead. The chapter on decision points will actually be helpful and has stuff I haven't heard about before, and is totes worth the current price of $2 for the Kindle version of this book. tl;dr when you've finished a task and are deciding what to do next, take extra long and decide on the right thing to do next, don't just automatically switch to something dumb/easy and waste hours on it. The author offered some very accessible tools that just about anyone can use at their desk or in their workspace. He encourages the task-oriented person to be realistically, biologically and mentally effective by working with and not against our neurology. Worth every penny. Just read it again, on a Sunday morning whim, to refresh. Some helpful & practical tips on how to approach life and your workday. I liked how easy it was to read, the practical tips and the research behind each piece of advice. The anecdotes from historical and present figures were also intriguing. I really loved this book - it's a quick read, with five main points that are thoroughly backed up with a lot of research. I really recommend it if you want to leverage your psychology to become more effective with your time. Very helpful guide on being happy with your productivity, that's real short, and boils down to five basic Maxim's (most which you are aware of but don't put into practice) that the author bakes into your mind with some common sense applications and real world examples. Great idea in principle and I think it's worth a try: Identify the most important tasks of a day and devote a hyper-focused two hours of the day to them. Yet, a lot of the other things in the book are a bit obvious. I am still going to give this one a try, though. Experimenting it next week. Hãy đăt ra 2h khoá cửa tập trung làm những việc cần làm. Don't float from task to task, strategically use these scientific, yet simple, principles to improve your effectiveness and performance. Clear, easy to understand, and quick to read. Surprisingly sensible advice on adding some sense of organization to the reader's work and personal life. I read it as a library book, but I may have to buy it for future reference.